Vancouver, B.C., June 12, 2018 - Titan Mining Corporation(TSX:TI) (“Titan” or the “Company”) today announced positive results from its 2018 exploration program at the Empire State Mine (“ESM”). 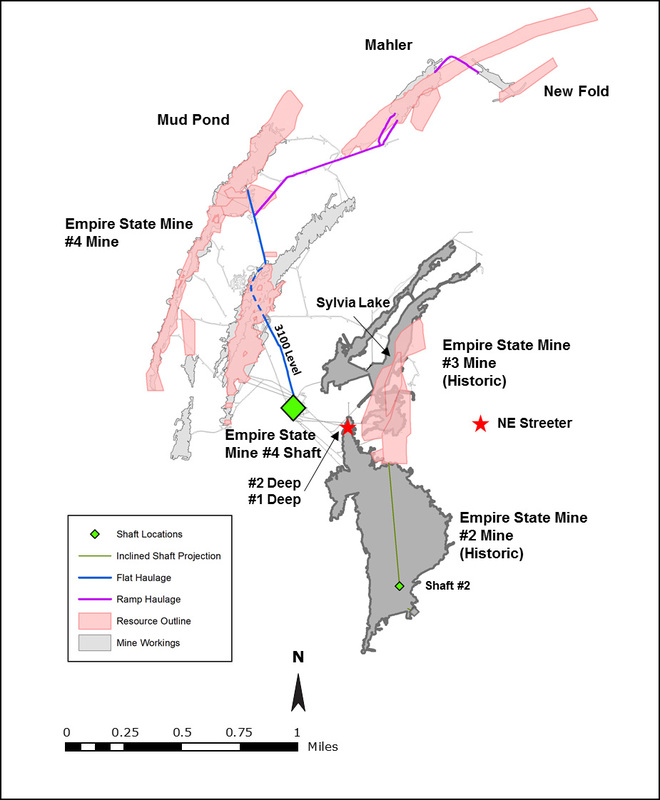 The ongoing review of historic data at the mine has led to the identification of two new zones - the #2 Deep zone, immediately below the historic #2 mine, and the NE Streeter zone located less than a mile to the east of the #4 shaft. The #2 Deep and NE Streeter zones, and the previously-known #1 Deep zone, which is immediately below the historic #1 mine, will be tested for down-plunge extensions. As part of the previously announced plan to expand throughput to 3,000 tons per day (“tpd”) in 2020, engineering work has begun on several fronts to support the economic analysis of the updated mineral resource. The #2 Deep and NE Streeter zones are not included in the current mineral resource at ESM, and there is potential for all three zones to provide additional mineral resources for the updated life-of-mine plan expected before year-end. All zones are above the current shaft bottom at 3,100 feet below surface. #2 Deep zone - This is a potential extension of a previously mined zone in the historic #2 mine. The #2 mine accounted for almost 18 million tons mined at a grade of 8.8% zinc, or approximately 50% of the combined historic production at ESM #1 to #4 mines. The #2 Deep zone is located 1,300 feet east of the #4 shaft. The historic estimate of unmined mineralized material at #2 Deep is 931,000 tons at a diluted grade of 6.59% zinc. The mineralization is open down-plunge to the north-northeast, and the extension has not yet been drill tested. There is potential to increase the strike length of the zone by approximately 1,000 feet, which would double the existing strike length. Drilling of this target from surface is scheduled to start in the third quarter of 2018, followed by underground drilling in early 2019. NE Streeter - This mineralized zone is located 2,000 feet southeast of the Sylvia Lake deposit and 1,300 feet from surface. The historic estimate of unmined mineralized material is 300,000 tons at a diluted grade of 6.28% zinc, and mineralization remains open down-plunge. #1 Deep zone - This is a potential extension of a previously mined zone in the historic #1 mine. The historic estimate of unmined mineralized material is 410,000 tons at a diluted grade of 6.95% zinc. Similar to #2 Deep, the down-plunge extension of the mineralization has not been drill tested, and there is potential to double the strike length of the zone to approximately 2,000 feet. The historic estimates of unmined mineralized material at the #2 Deep, #1 Deep and NE Streeter zones are shown in Table 1. Figure 1 shows the location of these zones relative to the historic mine workings and current mineral resources. The first priority of the exploration program continues to be the review of 100 years of historic data and the compilation, digitization and modeling of existing drill holes, geologic maps and sections. Early success in expanding the mineral resource at ESM was announced on April 10, 2018, and included an increase in inferred mineral resources of 3.1 million tons at an undiluted grade of 11.9% zinc. Only 40% of the planned review of historic data has been completed to date. The exploration team continues to evaluate historic data for the three new zones in order to construct detailed geology models. This data/information will be used to confirm the historic estimates of mineralized material and to guide future exploration drilling. The surface drilling program will focus initially on the #2 Deep zone, followed by the other recently identified near-mine targets in the second half of 2018.